1] Little or No adequate fire detection systems! 2] NO FRA on file [fire risk assessment]! 3] NO PAT testing evidence! 4] NO ELECTRICAL certificates on file! 5] LITTLE OR NO emergency lighting! Fire Officers suggested that those properties whether Holiday or Permanent letting properties through legitimate agencies or by Landlords complying with the rules, were the example to follow. We at MR ELECTRIC have for many years worked with Landlords and Agencies throughout the UK to ensure the safety of tenants and holiday makers. The MR ELECTRIC based near Truro in Cornwall have over a 1,0000 holiday lets and hundreds of permanent lets and HMO’s under their care. It may be advisable to consult with a Fire Risk Assessment specialist and MR. ELECTRIC can suggest someone local to the address. 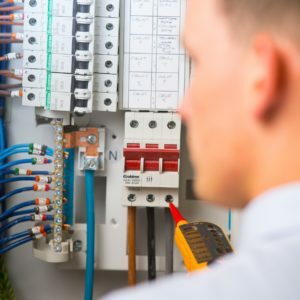 Normally for Commercial properties a full electrical inspection is carried out every 5 years [this can vary depending upon their use and other requirements?]. For Hotels certain testing requirements may differ depending upon FPO and Council HSE and in conjunction with local authority requirements and legislation. In addition, because of differing requirements by HSE, FPO and Insurers, many properties require an annual visual inspection including PAT testing. Many insurers policies insisting on these certificates and many are refusing to pay claims if there is no current electrical certificate and even if regular maintenance has not been carried out. 2. EMERGENCY LIGHTING: [TO BS5266]. 3. FIRE ALARM SYSTEMS: [TO BS5839].